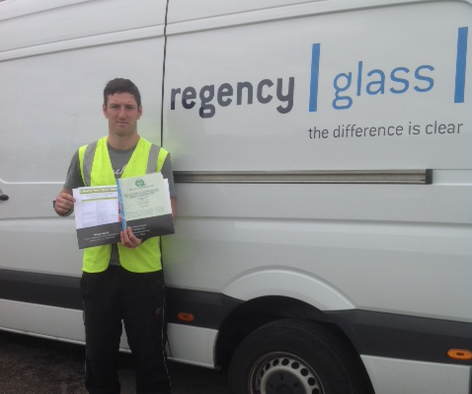 Daniel Aspden of Regency Glass was recently presented with his GQA certificate after achieving the GQA Level 3 Glass Related Distribution and Warehousing qualification with North Lancs Training Group. Daniel, who works in the despatch department at the Leigh based company, is the first candidate to achieve this qualification via the NLTG advanced apprenticeship scheme. He has completed GQA qualifications at Level 2 and 3 in Glass Processing previously and was keen to add the Glass Warehousing qualification to his CV when it became available. Daniel said "I am proud to be the first to achieve this via NLTG and am always looking to improve my skills; I know that the GQA qualifications are widely recognised and was recently surprised to find that on a 12 month working visit to Australia my Glass Processing certificate got me a job over there". Regency Glass have recently nominated a further 19 candidates for the apprenticeship scheme.